Home / 2-Headed Monster / 2-Headed Monster: Should Drivers Be Penalized For Field-Killing Crashes? Jimmie Johnson’s win in The Clash on Sunday afternoon (Feb. 10) capped off an eventful afternoon for Hendrick Motorsports. The four-car powerhouse finished 1-2-3-4 in Daytona 500 qualifying prior to Johnson rolling into Gatorade Victory Lane for his first win with new sponsor Ally Financial. While winning is nothing new to the seven-time Monster Energy NASCAR Cup Series champion, neither is being at the center of a restrictor-plate junkyard. Johnson’s contact with Paul Menard triggered the Big One and effectively ended the event with just under 20 laps to go. Johnson’s move looked to be a bit more aggressive than we’ve come to expect from such a seasoned veteran. Given the gravity of the accident, as well as NASCAR’s recent announcement to start disqualifying race winners found to have illegal cars, the question that arises is: Is it time to start penalizing maneuvers that end up wiping out huge swaths of cars and prematurely ending an event? The chance of wrecking has always been the cost of doing business at the most action-packed tracks on the circuit. In recent years, however, we’ve seen full-on field killers pop up in the most unlikely of events — such as Sunday’s Advance Auto Parts Clash and the Duel qualifying races for the Daytona 500. That cars have become more resistant to damage when contact is made has driven up the bravery quotient for some in the field. Remember Ricky Stenhouse Jr.’s aggressive swerving during last year’s Duel race? The resulting crash, as well as an accident in the Daytona 500, was tolerated, and while many drivers did criticize the tactics, there was nothing in the form of monetary or points retribution to be found for Stenhouse. Even this week during media day, Stenhouse said he “could care less” what people think about his actions on restrictor plate tracks. If there’s no consequence for driving like a lunatic, I guess that legitimizes the reaction. There needs to be a system of checks and balances put in place, particularly at tracks where the risk to equipment, drivers and fans is so high. This isn’t the first time Johnson has wiped out a field in a plate race either. For all of his achievements, Johnson has had a number of issues during his career for causing plate-track crashes or spinning out single-handedly, often affecting the outcome of the finish. Last year, Johnson took out Menard in the July race at Daytona International Speedway. In the most recent incident this past Sunday, the camera view on Kurt Busch’s car showed that Johnson tried to side-draft off of Menard to pass for the lead. Instead, Johnson caught Menard in the left rear and spun him, which lead to the virtually the balance of the field ending up in a pile in Turn 3. When Johnson made his move, the car suddenly yawed out to the right, and the sponsors and paint scheme of the right side of the No. 48 can be seen in clear view on its path to the No. 21. Perhaps it is a function of the new aero package that has the cars riding a few inches lower in the back, but the car’s response should not have been a surprise to Johnson at this point in the weekend. A case of too much, too soon? I understand the urgency to pass and try to take advantage of the gap Johnson and Menard had on the rest of the pack. But, come on, wiping out fields is bad for business — particularly in the season opener of the most pivotal year for the sport. Besides, what kind of effect does this have on attendance? A fan travels 1,200 miles to see a complete race and their driver competing, only to have them collected by what was an avoidable accident. I first went to the Daytona 500 in 1992, and Ernie Irvan took out the entire field at the halfway point while going for the bonus money, leaving six cars to finish on the lead lap. While he wasn’t fined, Irvan was persona non grata for about the rest of the year. There’s less consequence now for the top teams, and the aggression level gets to a point where there isn’t much give and mostly take — leading to what we had Sunday. Kevin Harvick was quite vocal in advocating to end The Clash based on the money involved. That could have been avoided had there not been an accident with less than 20 laps to go that didn’t need to happen. If it’s the final lap, it’s okay — things happen. But in an era where every weekend with NASCAR feels like a make or break event, drivers need to be cognizant of if their action is going to actually end up being detrimental to stock car racing. There was talk about Johnson having gone below the yellow line earlier in the event as well. If we had some checks and balances in place, like the threat of penalty for ruining everyone’s day, perhaps we could get rid of the yellow-line rule. It served its purpose when the majority of the backstretch was grass at the big tracks, but now it’s mostly pavement that helps scrub off speed or aids in cars getting back on track in the event of a spin. The threat of race-ending rain loomed on the horizon with 20 laps to go in The Clash – under those circumstances, who wouldn’t go for a desperation pass for the win? The calls for Johnson to be penalized after causing the late-race crash that handed him the victory are unwarranted, as it was simply a racing move gone wrong. With Mother Nature hovering over Daytona International Speedway, the momentum for Speedweeks hanging in the balance, and Johnson not winning a race in more than a year and a half, means that you can’t blame him for making a risky move to win the race. We’ve seen this happen time and time again on superspeedways with little to no repercussions, so why should it change? 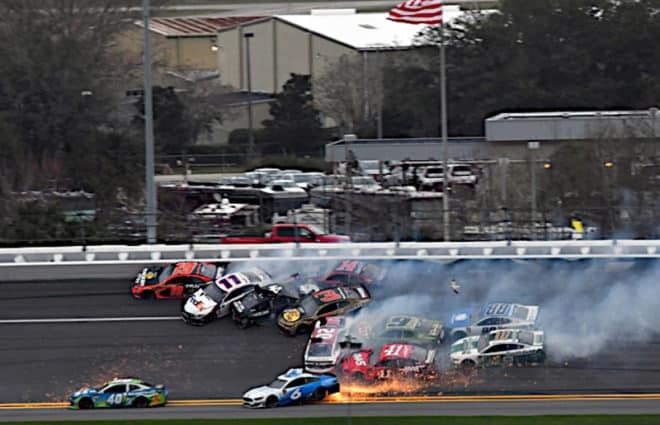 Ricky Stenhouse Jr. practically took out half the field at Daytona in the summer of 2018. NASCAR seemed to it chalk up to hard racing and moved on. Johnson’s move was just that. He made an aggressive move to slingshot past leader Menard, and the aerodynamic forces may have sucked the cars together and caused it, or one or both of the drivers moved toward the other and made contact. Whatever the case, the move resulted in what we see nearly at every superspeedway race – a junkyard of twisted metal and scattered debris. This outcome is a product of superspeedway racing though. We expect to see this every time any of the three national touring series visit Daytona or Talladega Superspeedway – close-quarters racing, daring moves and, as the laps wind down, a move that goes awry and sends several cars spinning into the wall. What Johnson did is no different than what countless other drivers have done in previous years – it just happened to coincide with another downpour that ended the race and Johnson being the beneficiary of his own mistake. Some might be unhappy with the no-call due to an inherent dislike for Johnson, Hendrick, Chevrolet or one of many other contributing factors that are part of a racing fan’s psyche. However, it’s simply a racing move that had unfortunate consequences. Similar incidents include Kyle Busch’s move on Kyle Larson last year at Chicagoland Speedway. Very few in the immediate NASCAR world took issue with that incident due to Larson’s similar move half a lap earlier. Brian Vickers wasn’t penalized in 2006 when he accidentally took out Johnson and Dale Earnhardt Jr. on the final lap at Talladega and went on to win the race. Brad Keselowski didn’t receive punishment after turning Carl Edwards at Talladega in 2009, sending the No. 99 flying into the catchfence as Keselowski – then in James Finch’s No. 09 – sailed across the stripe to win the race. In a subsequent case, Edwards wasn’t penalized when he turned Keselowski in a then-Nationwide Series race at Gateway Motorsports Park in 2010. Edwards spun Keselowski coming out of Turn 4, winning the race while Keselowski was involved in a violent crash behind him. 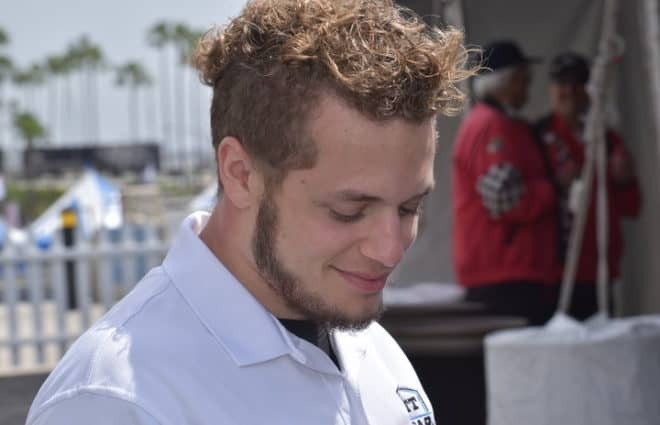 The leader becoming involved in a late-race incident and going on to win the event is nothing new to NASCAR, occurring countless times over the sport’s history and causing controversy nearly every time. Johnson’s move was out of a will to win the race, a move that’s relatively common in restrictor-plate and superspeedway racing. It was a move with unfortunate repercussions — a 15-car junkyard sliding down the embankment of Turns 3 and 4. Tags Daytona Hendrick Motorsports Jimmie Johnson Paul Menard Ricky Stenhouse Jr. I agree with Kevin Harvick. The Clash is a non points exhibition that puts both drivers and teams at risk that doesn’t justify the reward. That’s a big reason that the NFL abandoned the Pro Bowl between the playoffs and the super bowl. I won’t be surprised if the NBA and the NHL look at this kind of scheduling in the future. NASCAR and judgment call just don’t go together. As for Stenhouse? Enjoy your last Cup season Ricky.